Company and Securities Law in New Zealand, 2nd edition is a comprehensive treatise on New Zealand company and securities law and regulations by a team of highly experienced scholars and a leading practitioner. The text explains the theoretical background to the 1993 reforms effec... read full description below. 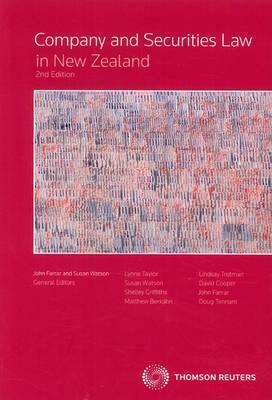 Edited by Farrar, John H.
Company and Securities Law in New Zealand, 2nd edition is a comprehensive treatise on New Zealand company and securities law and regulations by a team of highly experienced scholars and a leading practitioner. The text explains the theoretical background to the 1993 reforms effected by the Companies Act 1993 and deals fully with their practical implications. The text also covers the most recent reforms and amendments to company and securities legislation. This edition, as well as encompassing legislative and case law developments since the first edition (2007), includes two new chapters, one covering the choice of business structures and the other discusses the Financial Markets Conduct Bill and the upcoming securities and securities markets reforms.